Haiya Mega mall, which located in Baoan District, Shenzhen, the largest commercial complexes in the west of Shenzhen. It includes shopping, leisure, entertainment, sports, catering, cultural display and many other facilities. The annual sales of customers can reach 2.5 billion. Even more. In the food and beverage chain, Haiya Mega mall has imported a large number of well-known food and beverage outlets at home and abroad, forming a diversified food and beverage center ,which including large Chinese and Western restaurants, flavor food street and style bar street. In order to provide the best food environment for customers in the restaurant, and to create a fresh and environmentally friendly entertainment venue, Haiya mega mall decided to adopt a large-scale restaurant fume purification system for all its restaurants. So that formed a unified fume purification service. Guang Jie Environmental Protection Co., Ltd. mainly provides technical guidance for the construction of fume purification equipment and purification system in the project. In the project, a combined cooking fume purifier equipment is specially developed by GOJEK team. The main components of the equipment include two parts: electrostatic fume purifier + UV light deodorizer, which can provide 448,000 CMH air volume fume odor purification service. 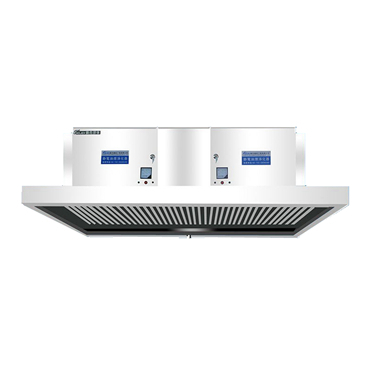 The fume removal rate is as high as 98.4%, which is one of the highest level of cooking fume purifiers in China. In addition, A standard modular industrial design is adopted for the system, with the ability to cope with the increasing of fume emissions and processing capacity of the system.